The only thing more reassuringly predictable than crawling along Queens Drive when heading to/from L4 amongst blue brethren on a game day? The calamitous queues that ensue at the turnstiles on opening day. Or at least outside the Bullens Road. Football was back, but more importantly, the toffees were back, and Roberto Martinez was not. So, in our first competitive game under Ronald Koeman, how would we line up? Three centre halves for the toffees on the left of this graphic. Idrissa Gueye sat in front of the defence on his debut, and made a very promising start to life in royal blue: 7 tackles- the same amount as Spurs’ five man midfield (Wanyama, Dier, Alli, Lamela and Eriksen) managed between them. No Everton central midfielder managed to make more tackles in any league game last season than Gueye’s 7 in his first outing. He slotted in like he’d always been there. Special mentions to James McCarthy and Holgate in defence- McCarthy in the unfarmiliar position of right wing-back, and Holgate making his first competitive start was at the heart of the defence. By Koeman’s own admission, it was a formation born out necessity due to injuries, but Holgate was excellent, and McCarthy performed about as well as could’ve been expected. To date, Holgate has done nothing to make you think he mightn’t reach (surpass) the levels John Stones did at Everton- still only nineteen, as Stones was a parting gift from Moyes, Holgate may well prove the same from Martinez. We might have a very good player on our hands sooner than anybody expected. An injury to Lukaku against Espanyol meant Deulofeu had to continue up front, as he had for much of pre-season, and he had Ross Barkley and Kevin Mirallas trying to provide the support. Few players will have been as happy to see Roberto Martinez depart as Kevin Mirallas: if you put the squad last year in order of who played the most minutes, Mirallas would rank 17th– he barely saw the field under Martinez, but he took advantage of his first start under Koeman with a display of industry. When the rust is knocked off, it could be a big season for Mirallas. It took just five minutes for us to net our first goal under Koeman, and it came as a result of a free-kick for a challenge on Kevin Mirallas, driving at the Spurs defence. We were one of only a handful of sides who didn’t score a direct free-kick in the league last season, five minutes in and Ross Barkley did just that. No sooner were you thinking ‘how has nobody managed to det a touch on that’ did the ball manage to find its way in at Hugo Lloris’ back post. A brilliant delivery from Barkley, and one that probably had Sam Allardyce wide-eyed, coughing up a “bloody ‘ell” as he spluttered half a packet of salt and vinegar McCoys in his excitement, watching on from his floral settee at home, as a large portrait of “er majestee” keeps watch over the Allardyce living room. He lined himself up with a couple of Spurs players, and was trying to block them from running in on the anticipated flight of the ball. He actually brushed Jagielka’s marker, and Jagielka came closest to getting a touch on the ball. Clearly instructions from training, it will be interesting to see if this continues. It’s pointless Deulofeu trying to win a header, so his sole responsibility is to spoil the run of an opposition defender. Cunning Koeman, eh? With Alderweireld now stretching to try and slide in and get the block. It was a tame effort, straight at Lloris- more on that later. The ball is going to be ran into the channels under Koeman, and it’s going to be up to Lukaku to make the most of it. Think his goal against Chelsea in the FA Cup- he’s going to be getting the ball in those areas against centre halves he should be faster than. It’s Koeman’s way of trying to create mismatches. It’s going to be up to Lukaku to make the most of it. If he’s as good as he says he is, he’ll thrive. We’re going to be playing in a way that will give him the ball in space, to attack defenders as he says he likes. A quarter of an hour in, and Everton were the better side. Gueye was rarely drawn from an area that wasn’t just in front of the defence when Spurs had the ball, pressing at the right moments with the others meant they couldn’t pick their way through. Funes Mori was fortunate to see Harry Kane penalised for what appeared to be a legal shoulder barge that left the Argentine international on his back in front of the ‘Howard Kendall Gwladys Street End’, but Everton were comfortable. 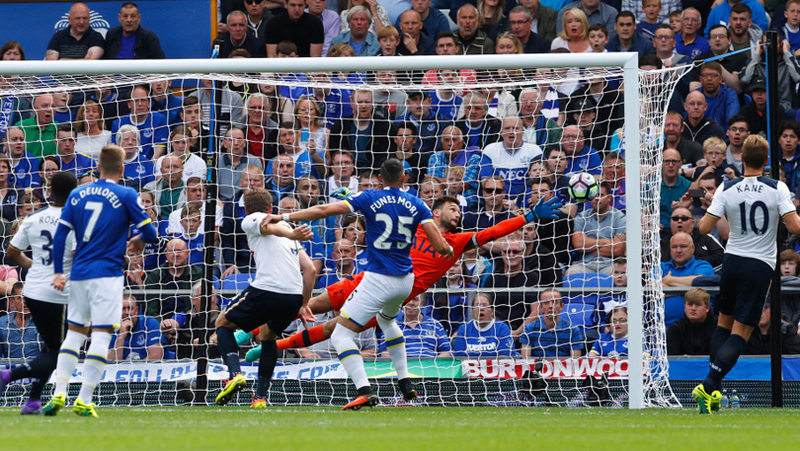 Jagielka had forced a decent save from Lloris, tipping his header over from another excellent Barkley free-kick. It was an absorbing game. Here, Deulofeu has the ball, and Mirallas has made a strong run from deep to get ahead of him- how often did we see that last year? Next to never? 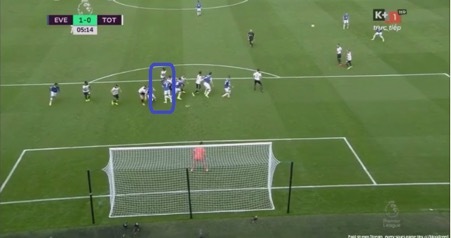 There was hardly ever someone further up the pitch than Lukaku, and almost literally never anyone making a run like this trying to offer a ball into a threatening area, drawing defensive attention. Encouraging stuff, even if it was an unspectacular shot at the end of it. Here, Barkley, Mirallas, and Deulofeu are each pressing almost level with the edge of the Spurs area, forcing them backwards. Had Danny Rose tried to play the ball inside to Wanyama, look at the speed Gueye is moving at as he sniffed the potential unfolding- it didn’t happen on this occasion, but it will at some point. Everton will wrestle the ball back in threatening areas as a result of this play- it’s the polar opposite of the Everton we saw under Martinez. Only to hit an unconvincing effort, saved at the feet of Vorm, on for Lloris, who’d managed to hurt his hamstring. We wouldn’t have as good a chance for the remainder of the game, and you want to see more conviction from a player with so much potential. At least Deulofeu was alive to the opportunity, and it’s pleasing that our pressing game forced Spurs into a mistake, but we can’t afford chances like this against good sides to go begging. It was from a familiar source- a cross out wide, and there wasn’t enough of an effort made to get close to keep it from coming in. Jagielka is too far from Kane who would’ve won a free header had the ball come his way. Similarly, Holgate is affording Lamela too much of a cushion, and he ends up nipping in front of the young defender to glance in the equaliser. It’s a really harsh lesson for Holgate who was excellent all afternoon, but perfect experience. Moments like these will improve him as a defender- still only a teenager- there’s no shame to be beaten to a good ball in, provided you learn from it. Diving to his left here to keep us level. Then just minutes later, a fortuitous break allowed Spurs to work the ball wide to Lamela in space who smashed a shot in, taking a deflection from Mason Holgate, diving to get a block. It would’ve been a cruel goal to concede, but Stekelenburg managed to readjust and tip the ball over the bar for a corner. Goodison rose in appreciation for a top save. Regardless of whether another goalkeeper does come in, it would appear Stekelenburg is an improvement on Joel, who in turn was a massive improvement on Howard towards the end. It’s moments like that which save points- a game of two halves ended without much further incident. A good start to a new era. Plenty to work on, but evidence of the work Koeman has already done was clear to see. Excellent analysis which reflects my view of the game, albeit in a more detailed way. Certainly and encouraging first game under RK though with plenty of room for improvement.